Article was originally published on Aedit. Our hair can say a lot about us. Unfortunately, for many people, hair loss is a growing issue. According to the American Hair Loss Association, 85% of men and 40% of women report significant hair loss by age 50. Younger people are affected too. While male pattern baldness is most common among older men, roughly 25% of younger men recall seeing signs of hair loss before the age of 21. When it’s this common, is it any surprise that men and women in the US spend more than $3.5 billion each year to treat hair loss? The average person loses 100 strands of hair a day, which is natural and unnoticeable because new hairs are constantly growing to replace the ones that have fallen out. True hair loss occurs when the hair growth cycle is disrupted or when a hair follicle is destroyed or shrunken. 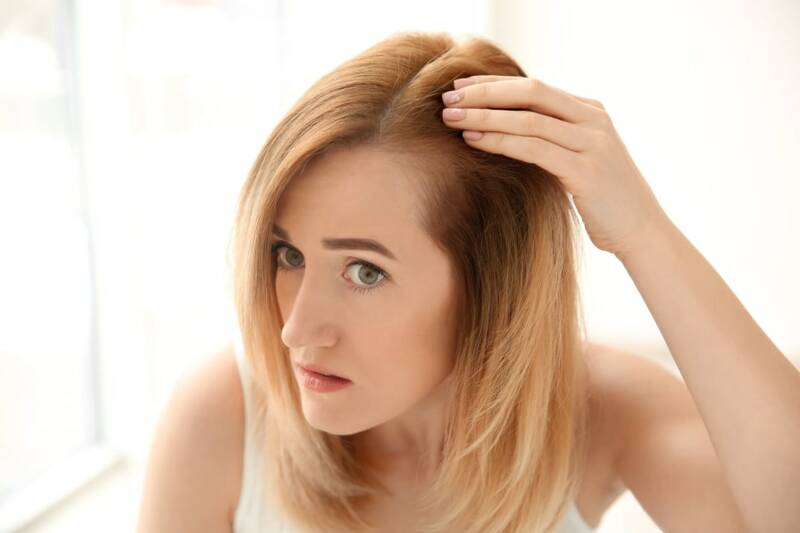 There are a variety of reasons of why someone might start to experience thinning hair. Some hair loss is temporary and can be due to stress, hormonal changes, or poor diet. Other hair loss can be permanent and might be due to environmental factors, health conditions, or heredity. Since there are so many causes of hair loss and thinning, there is no one cure-all. But as hair loss rates rise, there is more research, which leads to more solutions, and hair restoration doesn’t necessarily mean you need surgery. Here are five ways to promote hair growth without going under the knife. Since PRP requires the patient’s blood, it is more invasive than other non-surgical hair loss treatments. The doctor draws out a small amount of blood from the patient’s arm and processes the blood in a centrifuge, a machine which spins the blood at a high speed, to separate the red blood cells from the plasma. In doing this, only the enriched growth factors remain in the plasma. PRP is then carefully injected along the scalp into the thinning areas. Overall, the process takes about half an hour to complete, although it depends on how large the treated areas are. “PRP can only be used on the patient it is harvest from,” says Dr. Emer, which means that the blood extraction process is necessarily for each session. Low-Level Light Therapy (LLLT) has been around for about a decade, but has not reached the buzz of PRP or the name recognition of Rogaine or Propecia. Also called low-level laser therapy, treatments like iGrow and iRestore are available to consumers in the form of helmets. LLLT can be a good option for those looking for at-home treatments or more flexibility for their schedules. Rogaine is one of the industry standard topical hair loss treatments and uses an a DHT-blocking chemical called Minoxidil. It is clinically proven specifically on male-pattern hair loss and can be used by both men and women to maintain hair and stimulate hair growth. Minoxidil revives and increases the size of hair follicles have shrunk due to heredity hair loss and lengthens the hair’s natural growth cycle for thicker and longer hair. In addition to the vitamins and minerals you want to include in your diet, there are dietary supplements available as well. Before you invest in a bottle, it is important to identify whether you are looking to support hair growth or prevent hair loss. Like diet, supplements are not going to reverse damage that has been done. In other words, if you already have a receding hairline or bald spots, vitamins are not going to correct it, but could be beneficial when paired with a pharmaceutical treatment or procedure like PPR. Depending on preference, you can opt for supplements of a specific ingredient, like Biotin, or you can choose a multi-vitamin with a mixture of vitamins and minerals. There are several supplements in market that specifically support healthy hair growth, like NutraFol. Just keep in mind that supplements should not replace diet and there has been mixed scientific evidence. Speaking with your primary care physician can help you identify which supplements might be right for you.